Take metro line 8 to the terminal, Zhuxinzhuang Station, and leave from Exit B2. Walk southwards for a few yards to take bus no. 880 at Zhuxinzhuang Gongjiaochang stop. Get off at Donghuayuanzhen and then charter a car to go directly to the Dayingpan Village. Hike from the screen carved with 'Da Ying Pan the Great Wall of Ming Dynasty' by the road and go along an asphalt to the foot of the wall. 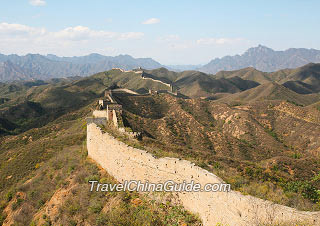 Climb up the ramparts to start this independent Great Wall hiking tour. After trekking for about 5 kilometers (3 miles), you will see a dilapidated watchtower and its clasped walls look exactly like tiny stupas of the Angkor Wat in Cambodia. After another 2 kilometers' (1 mile) hiking, you will reach at a water gate located at a low position. Pass by the water gate and climb up to the next hilltop to find a well-preserved white watchtower in front of you. It is nicknamed as Jade Tower by backpackers and marks the starting point of Yangbian Great Wall. Hike along Yangbian for 3 kilometers (2 miles) and you will see a stone stele on the open area by the ramparts. 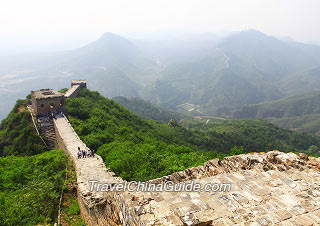 You can take a short rest there and then continue to conquer the Shuitou Great Wall. Along the way you will come across six special watchtowers in cylindrical shape. After hiking for around 10 kilometers (6 miles), please get down from the ramparts and go along a path for 5 kilometers (3 miles) downhill to Zhenbiancheng Village. Then charter a car to the Health Post of Mabaoquan Village (Mabaoquan Cun Weisheng Zhan) to take bus no. 33. Alight at Xihuan Zhonglu Stop in Changping District and then head southwards for 600 meters (660 yards) to take bus 345 Express, 872, or 883 to the downtown Beijing. Notice: Please get to the Mabaoquan Village by 16:30 to catch the last bus back to Changping. 'Yangbian' means the 'model of the Great Wall' in Chinese. It was so named because General Xu Da (1332 - 1385) once piloted the construction of the Great Wall there and then reinforced other sections along the boundary referring to it. The constructional materials were white and light yellow stones all shoveled from the nearby mountains. The wall extends for 3 kilometers (2 miles) and is of around 4 meters (4 miles) wide which can allow 8 horses to go abreast. Under the sunshine, this stretch of wall is like a giant white dragon resting on the rolling mountain ranges. The inspection of Yangbian Great Wall was quite strict. It is said that solders would shoot arrows at the wall after completed, and it was considered qualified if there was no loose. Therefore, ramparts of Yangbian are well remained, compared with other wild Great Wall sections, and even of a uniform height at any point.